I FINALLY GOT IT! YAY! Actually, my mom was super amazing and she picked up the last bottle at our neighborhood Ulta while I was at work and surprised me! Anyway, The Man With The Golden Gun is a limited edition top coat with pieces of real 18 karat gold leaf and it is part of OPI’s Skyfall/James Bond collection. I just love the way this looks. 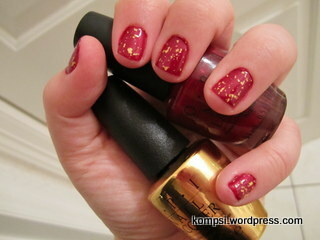 I used two coats of OPI’s Bastille My Heart, two coats of Golden Gun and one coat of top coat just to seal it all in. Although the price of Golden Gun is pretty high, I think it’s worth it. The effect is so unique because it’s not sparkly like glitter, but it has this beautiful metallic sheen and texture that gives your nail color so much depth. The picture doesn’t even do the colors justice, it is very rich and dramatic in person. I’m so excited to try the gold leaf on different colors! I think it’ll look amazing on like a deep eggplant. Wow, I’m getting inspired to wear my Christmas nail polish colors now! It’s hard not too when Christmas decorations started going up on November 1!